Simply roll up your float and you can store it or carry it in this handy tote. 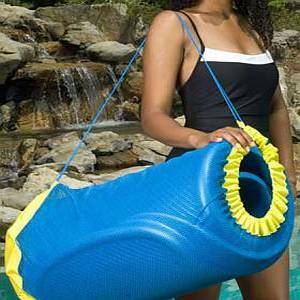 Made out of durable nylon mesh this tote is strong and allows the float to easily dry and breathe. Drawstring doubles as a shoulder strap for easy portability. Measures 71" x 32" x 21½". Aquamarine only.